Derek Jarman, born 1942, Artist, Painter, Writer, Film-Maker and Gay Activist. A truly universal man who was outspoken about homosexuality. He sadly died of an AIDS related illness in 1994. The Artist recalls that Jarman, ‘liked the idea of being portrayed on a medal in a tradition going back to Pisanello’. 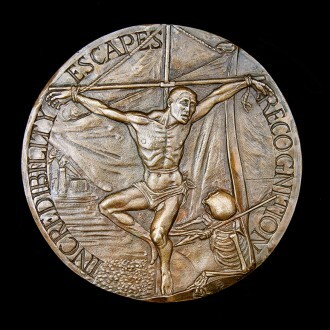 The allegorical reverse of the medal refers to the religious iconography that features in Jarman’s film The Garden (1990). 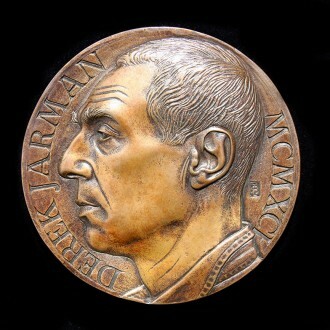 The medal is in the collection of the National Portrait Gallery and the British Museum.